As Conference Championship weekend approaches, it feels like a good time to take a look back at the 2018 season from an IDP fantasy football perspective. I’ve often stated playing in IDP leagues is like riding a hummingbird, and the 2018 season certainly had its share of ups and downs. There were the usual concerns regarding injuries and suspensions, although I will say it seemed like more big-name IDP talent went down to injury in 2018. Of course, I likely said the same thing following the 2017 campaign. Let’s take an IDP look back at 2018. Prior to the 2018 season, I wrote a piece regarding the re-emergence of the defensive line position for fantasy purposes. For the most part the season bore that reasoning out. There were 14 defensive linemen who recorded 10 or more sacks last season, up from the 13 in 2017 and 8 in 2016. Leading the way was Aaron Donald of the Los Angeles Rams, who put up a career-high 20.5 sacks and finished as the top fantasy producer at the position. Donald also led the position in total quarterback pressures, posting 106. Showing that he’s not just a fantasy force, Donald also graded out as the top interior defensive lineman. 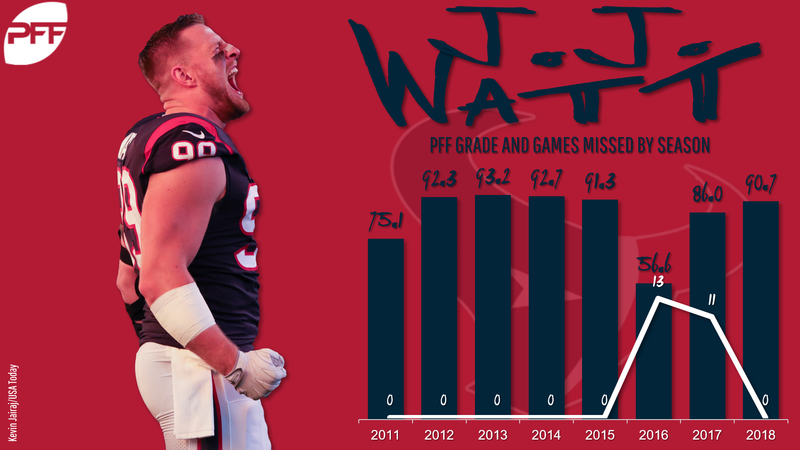 Another boost to the position was the return of a healthy J.J. Watt. Watt managed to play 16 games for the first time since 2015 and finished the regular season with 16 sacks. It’s the fifth time Watt has surpassed double-digit sacks in his career. He added seven forced fumbles to finish second in fantasy scoring behind Donald. Let’s give a little love to the defensive line breakout player of the year. Defensive tackle Chris Jones of the Kansas City Chiefs had a monster 2018 season finishing with 15.5 sacks along with two forced fumbles and an interception return for a touchdown. Jones set an NFL record by recording a sack in 11 straight games. Danielle Hunter of the Vikings bounced back after a down 2017 season by posting 72 total tackles and 14 sacks and scored a defensive touchdown. Look for another big season in 2019 from both Hunter and Jones. It wasn’t all good news for dominant defensive linemen, as Joey Bosa of the Chargers suffered a foot injury that kept him out until Week 11. IDP owners who held on and waited for Bosa’s return were rewarded a bit as he finished the season with 23 total tackles, 5.5 sacks, and a fumble recovery while playing 316 snaps. A healthy Bosa should remain a top defensive line draft selection in 2019. Myles Garrett of the Browns remains an ascending fantasy performer having put up DL1 numbers in most balanced scoring formats with 13.5 sacks and three forced fumbles. As per usual, rookie defensive linemen struggled to produce from a fantasy standpoint. Sam Hubbard of the Bengals finished with six sacks and did manage to score a touchdown. A toe injury hampered Marcus Davenport of the Saints, but he did manage 4.5 sacks in 13 games played. Both should see an uptick in performance in their sophomore seasons and are redraft options for fantasy purposes in 2019. The linebacker position was hit hard by injuries as top five preseason favorites Deion Jones (foot) and Kwon Alexander (ACL) missed significant time in 2018. There were also injuries to top past performers such as Sean Lee (hamstring), Denzel Perryman (knee) and Vontaze Burfict (concussion). There are some concerns that Burfict’s career could be in jeopardy, so that is an offseason situation to closely monitor. There was a lot of preseason hype regarding the 2018 rookie class of linebackers and for good reason. Youth was certainly served, as four rookies finished with top-12 totals in balanced scoring formats. Indianapolis Colts rookie Darius Leonard had a phenomenal season and finished as the top fantasy linebacker. Leonard got it done in all facets of the game finishing with 161 total tackles, seven sacks, two interceptions, and four forced and two recovered fumbles. Leonard was all over the field, brought on the pass rush 44 times in 2018, and missed just nine tackles in the regular season. In the Colts’ two playoff games Leonard totaled 27 tackles and should be the top linebacker selected in 2019 fantasy drafts. Despite starting the season as a part-time player, Dallas rookie Leighton Vander Esch exploded onto the fantasy scene last season. Over the first three weeks of the season, Vander Esch averaged just 26 snaps per game before the hamstring injury to Sean Lee cleared the path to a bigger role. The rookie never looked back, posting 140 total tackles and a pair of interceptions en route to a top-five fantasy finish. Look for the Cowboys to likely move on from the veteran Lee (if he decides to keep playing) in order for Vander Esch to have a full-time role. Chicago’s Roquan Smith and Buffalo’s Tremaine Edmunds lived up to their first-round NFL Draft selections by putting up top-12 fantasy totals each. Another rookie performer of note was Fred Warner of the 49ers, as he finished the 2018 season with solid LB2 numbers despite fading a bit down the stretch. The Rams knew what they were doing by trading Alec Ogletree to the Giants in order to get Cory Littleton on the field in an every-down role. Littleton had 91 solo and 124 total tackles in his first season as a full-time player. Littleton also added splash-play production with four sacks and three interceptions. Consistent fantasy producers Luke Kuechly, Bobby Wagner, and Telvin Smith continued to produce top-10 numbers living up to their top-end ADP once again. The top edge rushing outside linebacker from a fantasy perspective was T.J. Watt of the Pittsburgh Steelers. No longer just considered J.J.’s little brother, the younger Watt put up 13 sacks and a healthy 68 total tackles, equating to solid LB2 totals. On the downside were underwhelming seasons from veteran fantasy producers C.J. Mosley of the Ravens and Zach Brown of the Redskins. Both finished outside the top-30 in fantasy scoring despite Mosley remaining a three-down linebacker. It appears Brown had been reduced to a part-time role for Washington as he played just 67% of the defensive snaps while teammate Mason Foster played 98% All in all, the IDP landscape is looking stacked at the linebacker position moving forward with all the young talent emerging. The 2018 season once again proved why it’s an advisable strategy to hold off on selecting defensive backs until late in the draft. The variance of top scorers from year to year was front and center in 2018 as only two players that finished in the top 12 in balanced scoring in 2017 repeated the feat. By comparison four linebackers did so (considering four rookies crashed the party that’s not bad) and six defensive linemen had back to back top 12 performances. To be fair, injuries once again played a part as Falcons safety Keanu Neal (ACL) was lost for the season in Week 1 and the Giants Landon Collins (shoulder) was placed on IR following Week 12. There was also a steep fall from grace for Dolphins safety Reshad Jones, who failed to reach double-digit tackles in any of the 14 games he played. Jones dealt with a shoulder issue early and then mysteriously pulled himself from the game in Week 9. Jones, Collins, and Neal were the top three defensive backs off the board according to their ADPs at My Fantasy League. On the plus side, much like the linebacker position, there is plenty of young talent regarding defensive backs. Chargers rookie Derwin James stepped in immediately as a starting strong safety and put up 105 total tackles with three interceptions and 3.5 sacks. In the regular season, James lined up in the box or on the defensive line 623 times, which IDP owners love from their defensive backs. Another standout rookie was starting free safety Jessie Bates of the Cincinnati Bengals. 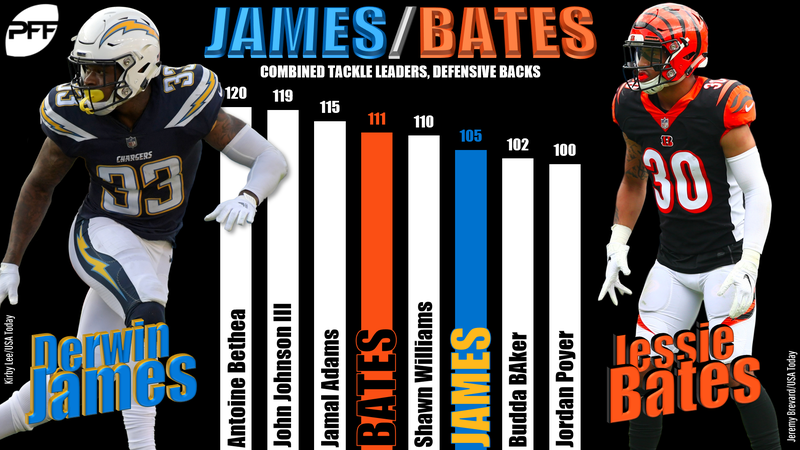 Not as much of an in-the-box or defensive line threat (lining up there just 198 times), Bates still managed an impressive 111 total tackles. Bates also flashed splash-play ability, putting up three interceptions and a defensive touchdown. Second-year New York Jets safety Jamal Adams was the top-scoring defensive back in 2018 and fellow sophomore John Johnson III of the Rams finished as the third-highest scorer. It’s no surprise that they lined up in the box or on the defensive line 626 and 430 times respectively. There’s a definite youth movement at defensive back with eight of the top 12 scorers being 27 years old or younger. A tip of the cap to an outlier in 34-year-old Antoine Bethea of the Cardinals who posted triple digit tackles (121) for the seventh time in his career while adding three sacks and a forced fumble. There could be a changing of the guard at the top of the defensive back rankings heading into 2019 with the plethora of young talent emerging at the safety position and the leagues shifting to utilizing the position as extra linebackers. The safety position accounted for 11 of the top 12 scoring defensive backs in 2018.